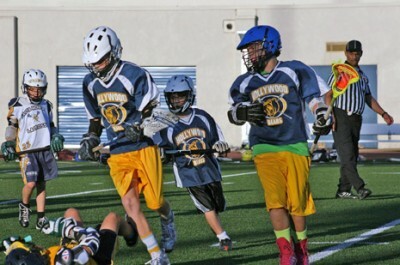 NEW PLAYERS ages seven to 11 are now being accepted to lacrosse program. Last year, the Hollywood Bears was a struggling team with only 12 players, said head coach Rob Woodley. Today, enrollment in the lacrosse program has increased to 40 members, and its team of 9 and 10-year-olds is on a six-game winning streak. “We have several new coaches with great resumes, and our future is looking bright,” said Woodley, who recruited the players and assembled the coaching staff. The men—Skyler Hopkins, Michael Song and Peter Swander—have a combined 50 years of coaching experience. Hopkins was a three-year starter and captain of the nationally ranked Eagles at McDonogh High School in Baltimore. At Middlebury College, he earned All-American Honors and played four times in the NCAA tournament. Coach Song was a starting midfielder for the Korean National Team in 2002, leading the World Cup in total points after the first two rounds. Swander was captain of his high school, regional and state all-star teams. At Wesleyan University, he started as a freshman at the attack position. Head coach Woodley played lacrosse at Cate High School and for the Claremont colleges mens’ team. After graduating from Pomona College, he coached lacrosse in Long Beach for several years. New players ages seven to 11 are now being accepted. To register, go to hollywoodyouthlacrosse.com, or contact the head coach at Woodley.robert@gmail.com.